Powers: Due to genetic tampering she has an enhanced metabolism allowing her to heal faster than a normal human, in addition she possesses superhuman agility, strength, speed, eye sight, reflexes and razor sharp claws on her hands and feet able to cut through metal. Rosabella was a student at a University in New York City when she was abducted by Maxwell lord and sold to the “Wildebeest Society”. Here she was subjected to inhumane genetic tampering which made her a human/cat creature that was the only real success story for the villains after all other experiments died. As experiment twenty four “X-24” she escaped and later waged war against those that had disrupted her life. Seeking revenge she faced Deathstroke multiple times as well as the Teen Titans whom she later joined. As a member of the team she managed to find out who was behind the initial experiment which created her and realize she was an altered human instead of an altered animal as she originally suspected. 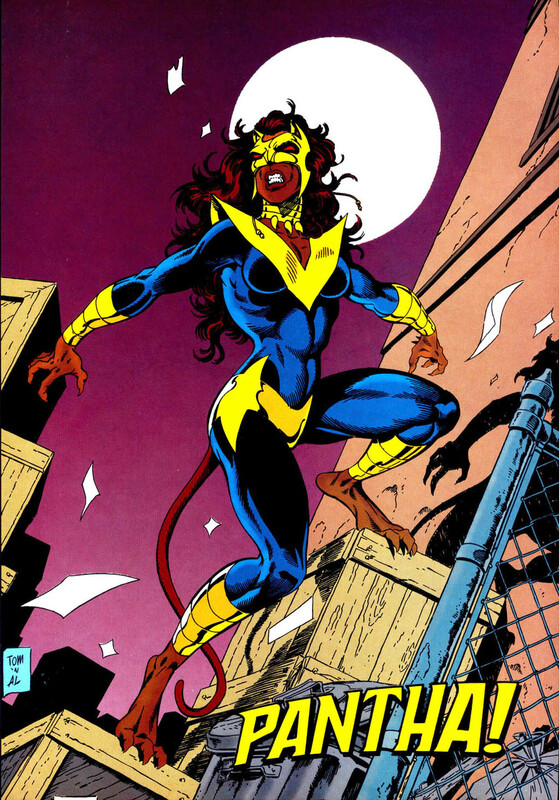 Pantha later left the team along with Baby Wildebeest and Red Star to become reserve members of the Teen Titans as they lived in Russia. She helped the team rescue Cyborg during this time and battle Dr. Light. During infinite crisis she was killed in battle by Superboy Prime and later attacked the Teen Titans as a black Lantern during blackest night.